Operation Christmas Child’s online shoebox site, where you can pack an Operation Christmas Child gift-filled shoebox and share God’s love with a hurting child overseas, without even leaving your home. 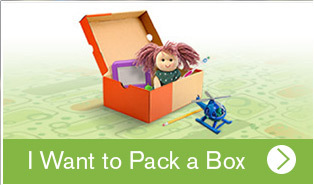 Packing a shoebox gift online is simple! 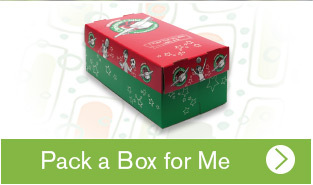 Challenge your friends to help you reach your shoebox gift goal! Decide how many shoeboxes you want to fill and give, include a photo, and then share your goal with friends and family, asking them to build shoeboxes online with you. Thanks to the help of generous suppliers, your dollar is buying more! Many of the companies that provide toys, school supplies, and hygiene items to include in the shoeboxes you donate online provide them to us at significant discounts or at no cost. When that happens we are able to stretch donation dollars for greater impact and pack even more shoeboxes. Want to pack physical shoeboxes? Click here to get started!